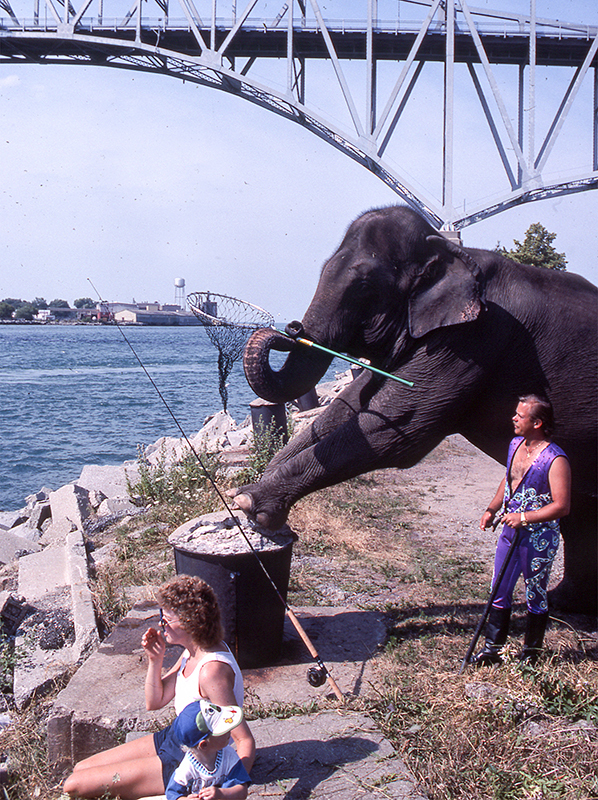 Famed animal trainer Gunther Gebel-Williams, working with an elephant at the Blue Water Bridge during a Tourism Sarnia-Lambton promotional shoot, circa 1992. After retiring from the ring in 1990, Gebel-Williams took an animal care management postion with the Ringling Bros. and Barnum & Bailey Circus. Courtesy Lambton County Archives, Photographic Collection, 6J 2016.045.165. The Journal recently published a photograph that showed an elephant standing beside a man in a purple outfit on Point Edward’s waterfront. That man, Gunther Gebel-Williams, may well have been the most talented animal trainer that ever lived. Seeing his farewell tour with the Ringling Bros. and Barnum & Bailey Circus, in October of 1990, is one of my fondest memories. Gunther Gebel-Williams made his entrance into Detroit’s old Joe Louis Arena that day standing with a tiger, both of them atop a walking elephant. For the grand finale, with a single word, 30 elephants stood on their hind legs in a fluid line, stretching from one end of the arena to the other, all moving as one. It gave you that place-a-milestone-here feeling, that what you were witnessing would never again be replicated. Nor, for that matter, would we today condone anyone even trying. The perfection and artistry was a showcase of Mr. Gebel-Williams’ unique rapport with his animals, a rapport based on positive reinforcement and words spoken softly. It was enthralling to see him working, caged with 18 tigers, at times with his favourite leopard draped across his shoulders. Proudly, they were trained, not tamed. The show was a chess game of mutual respect, and the fascination and enjoyment of seeing it in person was my raison d’etre that evening. It was stunning! Gunther brought out three dozen Lippizan stallions with their four-off-the-floor jumps, in three rings, similar to his elephant act. Both were akin to a reduced RCMP Musical Ride, albeit without riders, save for his own ping pong-like rodeo tricks, and those of his premier tiger honed decades earlier in his Circus Americano-themed shows in Europe. At the age of 13, in Germany, Gunther Gebel joined Circus Williams. He worked in every capacity, from training all of the animals to performing acrobatics. He even took the name of the circus’ owner. When Ringling Bros. bought Circus Williams they got Gunther’s unprecedented skills, his spirited animals and his passion for the circus. The blessing was ours to have hosted him that sunny day, with his fishing elephant, beneath the Blue Water Bridge. 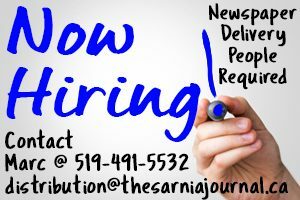 Susan Ward is a retired Certified Pedorthist in Sarnia who keeps getting talked into going back to work.